In addition to having a fantastic shop for exclusive use by our members, we are also fortunate to have a number of other special resources that help members go deeper into woodworking and enjoy the GWG experience. 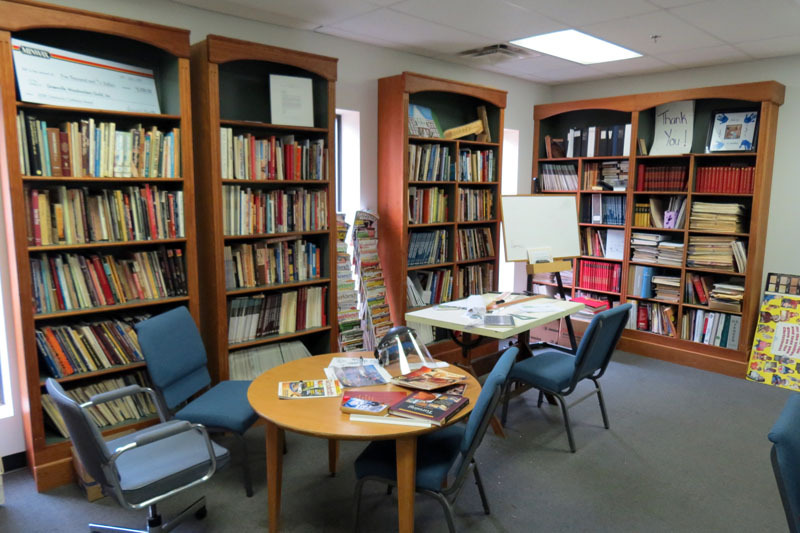 At right is a picture of a small, but terrific Library, filled with hundreds of woodworking books and magazines. The books are the same ones you might be tempted to buy yourself, but here you can peruse them for free. And our magazine collection includes near-complete sets of Fine Woodworking, Wood Magazine, Woodsmith, ShopNotes, and others. Our Lumber Room is very well stocked. 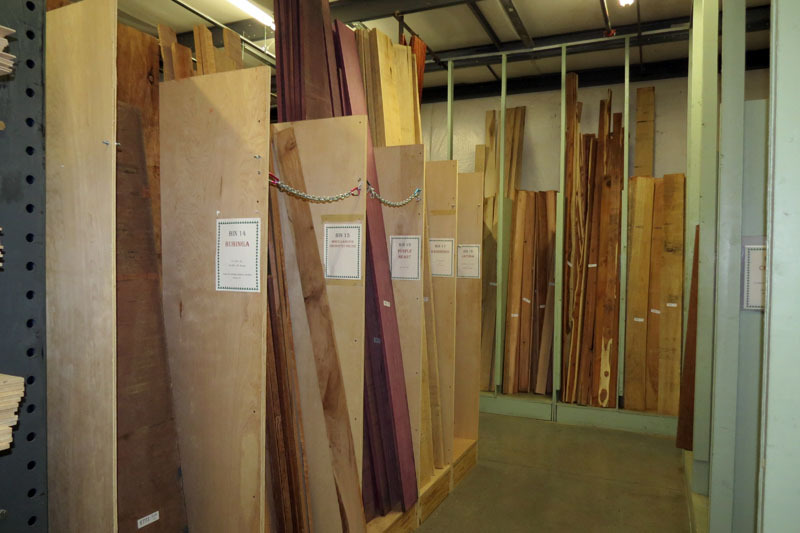 In it you'll find a broad selection of hardwoods including White and Red Oak, Maple, Walnut, Cypress, and Poplar, as well as more exotic species like Bubinga, Padauk, and Wenge. 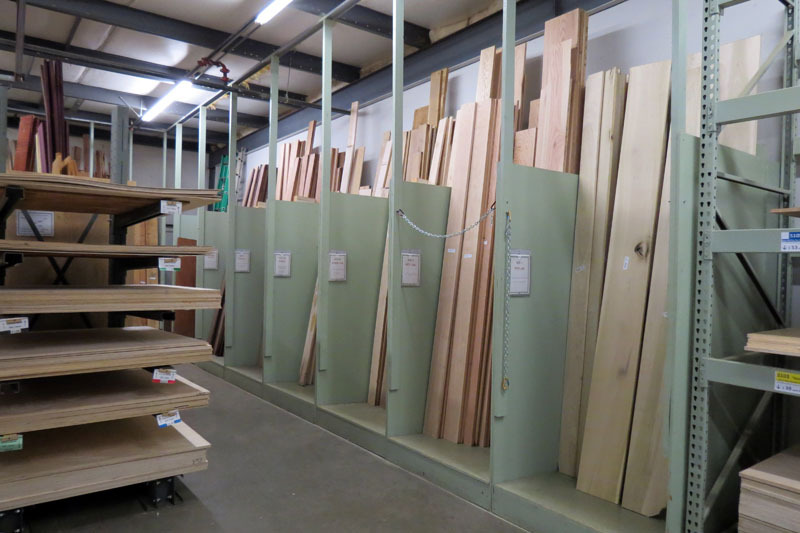 If what you need isn't in stock, our lumber manager, Aubrey Rogers, will special-order what you're looking for. And the prices are hard to beat! We also have a special classroom for our Teen Woodworkers program. It's equipped with hand tools, benches, and lathes, appropriately sized for younger woodworking enthusiasts. 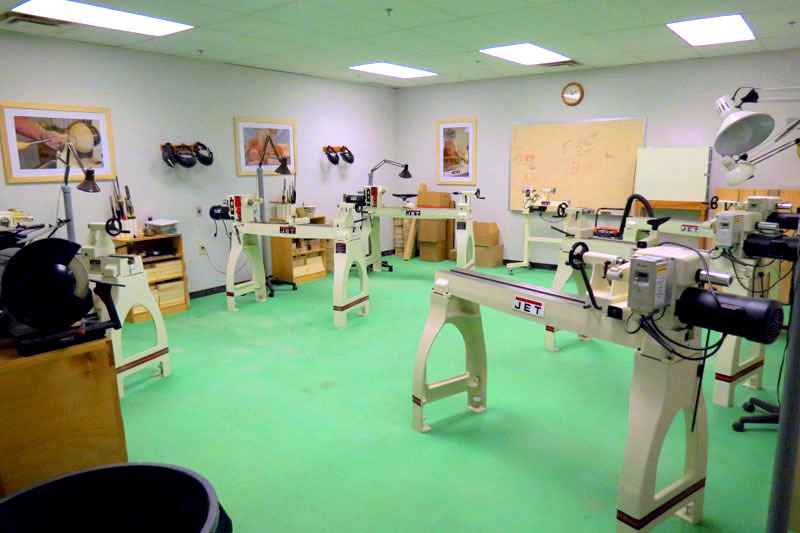 Speaking of lathes, if you take one of the Guild's woodturning classes, you'll do so in our dedicated lathe training room. 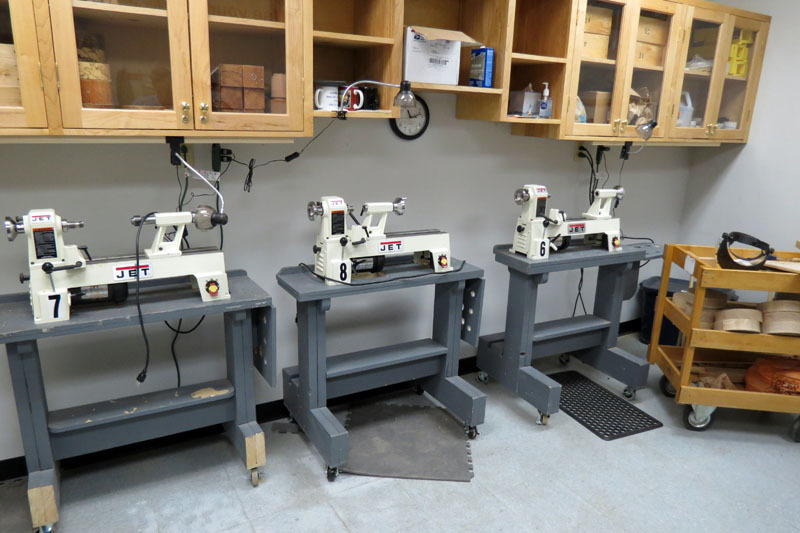 It's equipped with six Jet lathes - one for the instructor and five for students. It's a great facility and a pleasure to take a class in. Here's a shot of our presentation auditorium, taken from the stage. 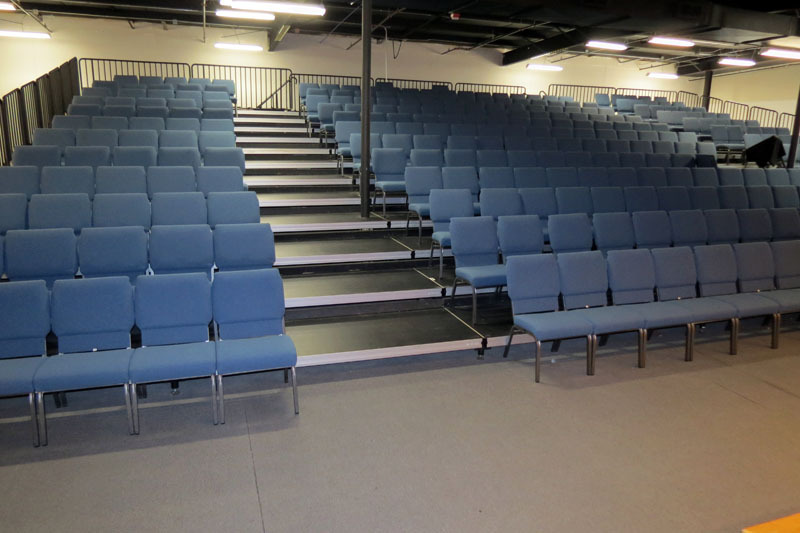 Seating is cushioned and comfortable, and the tiered arrangement makes it easy to see what's happening on stage. 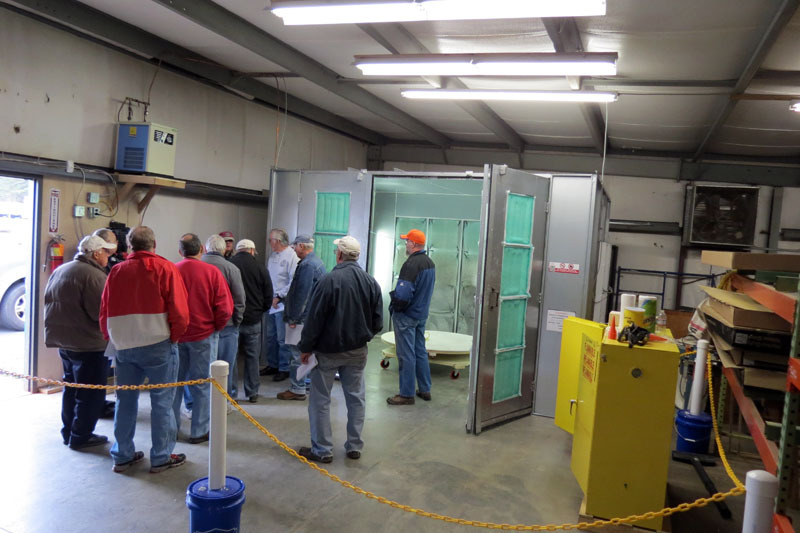 One of the newest resources for our members is our professional spray booth, located in an outbuilding that is adjacent to the main shop. Members can reserve time in the booth which is equipped with more compressor power than you'll ever need, industrial grade ventilation for safety, and a wide array of jigs and work holders to help make the spraying experience successful.